You Must be Born Again. Does that Also Mean Dying Again? "You must be born again." Perhaps you have heard this before. Obviously, everyone reading this has been born once and we expect to die (Nothing is certain in life except death and taxes). It would seem that death is certain. If we are born again - born twice - does that mean we must also die twice? Birth, death and resurrection is something that (nearly) all will experience, in some cases, more than once. Some people are confused by talk of a second birth or a second death. This is part one in a series of five parts looking at births, deaths and resurrections and how they fit into each person's experience. The focus is on the number of times that different people or groups of people are born, die or are resurrected. 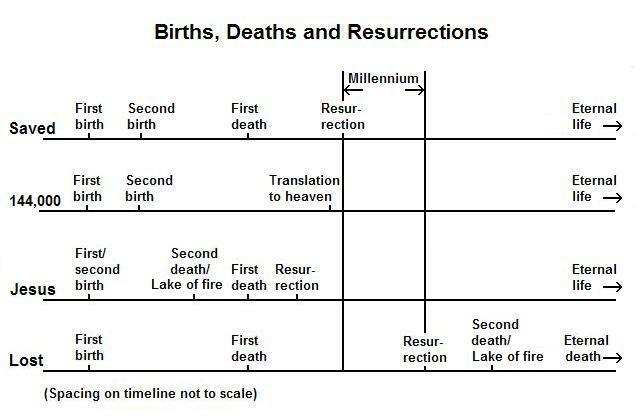 Note (in the diagram above) that the saved are born twice and die once, while the lost are born once and die twice. Although we don't start out that way from birth, we can, by our conscious choice, have the presence of the Spirit dwelling in us. "How can a man be born when he is old?" Do not be afraid of that command - "you must be born again" - it is the way into a correct relationship with the God of creation who wants to give us every good thing including eternal life. 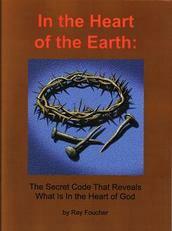 He wants to save us from the second death the topic for part 2 in this series.